I read this first right after it won the Man Booker Prize in 2013 and loved it. (The review is here.) The history, the Victorian-type language, Dickensian plot, etc. everything was right. But it is a plot-driven novel (pretty much) so I really didn’t think it would hold up to a 2nd reading. But the Booker Prize Group chose it so I thought maybe I’d give it a try. I often enjoy rereading good books – if they hold up for a second reading they get a 10 rating – those are “great” books. If not -then a 9.5 is as good as they’ll get overall and that’s likely based on the first reading. 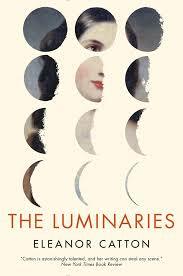 The Luminaries didn’t quite get there – I think it was more convoluted and dense than necessary – And I think there were times when it became a “structure-driven” story – lol – but yes. But for the first couple chapters, and other places throughout, it felt so good to get together with Catton’s characters and in that setting again. I was both reading and listening again because on my first go-round the characters in Chapters 1 and 2 really confused me so I added the ebook version). The ambiance of the narrative was wonderfully familiar and as I read Chapter 1 again the whole thing clicked into place. So what was I going to get out of a second reading ? But truthfully, it got awfully long the second time. There just really wasn’t all that much new to uncover, no real layers of meaning, etc – and I wasn’t interested in pursuing the astrology. But I wasn’t quite sure if I remembered the ending – or all the parts of it – so I kept going. That’s the thing with this book I think Bekah – and you have confirmed it for me without my having to reread it again. And this is the “layers of meaning thing”. I really enjoyed the read, but I felt it was a complicated structure which got in the way of exploring or exposing “meaning” or “ideas” that you can get your teeth into. Too plot and structure driven I think.